I’ve gone processed sugar free for about 8 months now. I’ll write more about that later, but there was one thing I was struggling with – pancake syrup! I hadn’t made my high-protein pancakes for months, but last week I had a craving for them. I had the smallest amount of pure maple syrup with them, and while it’s not a processed sugar, it was still sweeter than I wanted or even enjoyed. So, when I decided to make them again I came up with this very simple topping that you can make fresh while your pancakes are on the griddle. Rinse and dice the peach and put into a shallow bowl. Use a potato masher, mash the diced peach until you have some juice but still have small chunks of peach. Add about a tablespoon of apple juice (a little less/more depending on how juicy your peach is. Add 1 teaspoon of chia seeds and stir for several minutes. The chia seeds will probably stick the edge of the bowl as you stir; be sure to push them back down into the juice mixture. Let the mixture sit for at least 5-10 minutes while the chia seeds absorb the juice. Now scoop up some of the mixture and let it drop off the spoon back into the bowl. It should fall off the spoon smoothly, but not runny. If too juicy/runny, add more chia seeds, stir, let sit, and check again. If you’ve made it too thick for your taste, you can add a splash more apple juice. That’s it. 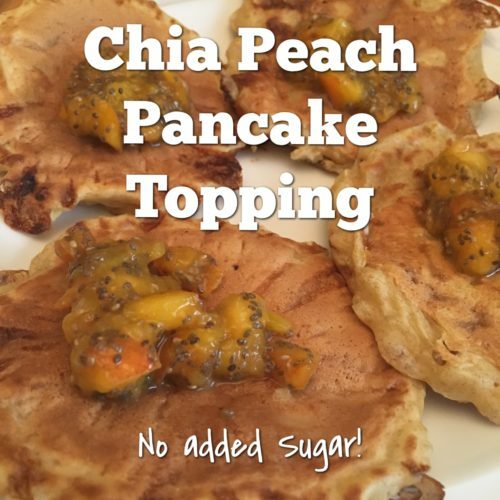 Use atop your favorite pancakes and enjoy! Variation: If you don’t have a fresh peach, you can use frozen (though it’s not quite as good.) Warm them up on low in a small sauce pan and mash once fully defrosted and warm, you shouldn’t need to dice them. I make them a few times a week, placing leftovers in a ziplock bag with a paper towel in the fridge. Then on mornings we don’t have time for a fresh batch, we’ll wrap them in a fresh paper towel and microwave for 30 seconds. Just as good for a couple days after, and better for her than the pre-packaged. Spray a pan or griddle with oil and warm pan over medium heat. In a medium bowl, combine the yogurt, eggs, and milk with a large metal whisk. Add the flours and baking soda, continue to whisk. Add vanilla and whisk until smooth but not runny. If too thick and a little more milk, if too runny, and a little more flour. Spoon or ladle onto hot, oiled/sprayed griddle or non-stick flat pan, being careful not to make too big of pancakes, and remember the batter will spread. About 2″ diameter or smaller usually cooks evenly for me. If you make them too big, the thick batter may not cook through, or you’ll have trouble flipping them. Cook on the first side until bubbles start to form in the middle of the pancake and top edges start to cook. (It’s sort of like the edges look drier.) Flip and cook a few minutes more until golden brown. Time will vary based on your griddle/pan and stove. 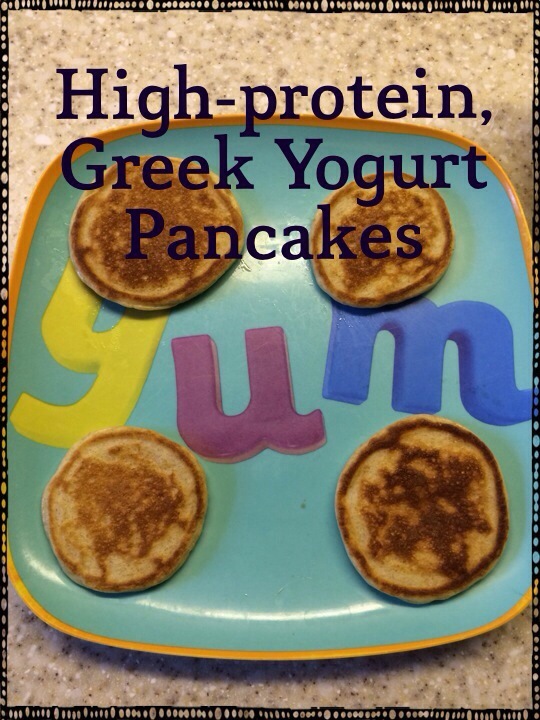 Use flavored Greek Yogurt. Great way to use up individual cups about to expire. Add whole frozen blueberries to the batter. If you’re making for someone who doesn’t need to gain weight, you can substitute 1% or 2% milk & non-fat yogurt and it should work just as well. For those of you who haven’t made pancakes your whole life, here’s a few tips I’ve picked up from my mother, books, and just lots of pancake making. Don’t worry, we’ve all filled the kitchen with smoke & covered our spatulas with batter at some point. Making the perfect pancake is much more about honing your cooking technique than the recipe. Place pancakes on a plate in the oven at the lowest temperature, no need to preheat, to keep pancakes warm while you cook. This will also let pancakes you didn’t cook quite long enough continue to cook before you serve them. Spray the pan/griddle after each set of pancakes to avoid sticking. Using a wire whisk instead of a wooden spoon (even when you add dry ingredients) makes it easier to combine the ingredients without over mixing. Use a wide flat metal spatula for easy flipping. I really like this OXO spatula. Wipe it with a paper towel if it gets batter on it between pancakes, and don’t make pancakes larger than your spatula. Cook just 2-3 pancakes at a time until you’re sure you’ve got the timing/temperature of the pan right. Every stove and pan combo will have different cook times.